SEG Fabric and Frames are being used in a multitude of different venues to display large imagery. SEG is short for Silicone Edge Graphics, meaning that the edges of the fabric graphic are sewn with a thin silicone strip that is inserted into a channel around the perimeter of the frame. 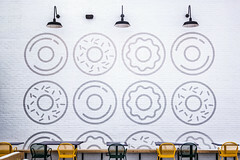 Once installed, the graphic has a smooth appearance that is superior to even a rigid substrate. Today you can find SEG signage being used anywhere from large retail locations to airports. Below are 10 familiar places where SEG is making a huge visual impact. 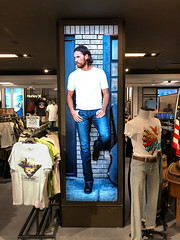 Seen in The Gap in New York City, these large SEG Light Boxes feature attractive Backlit Silicone Edge Graphics, illuminated using LED lighting. The light boxes were roughly 10 feet wide by 8 feet tall. 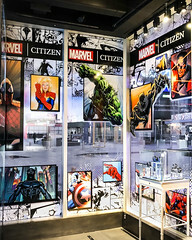 NikeTown in Las Vegas featured several large SEG frameless light boxes and graphics. The printed Backlit Fabric promotes several of Nike’s sponsored athletes like LeBron James. The graphic in this photo is 4 feet wide by 10 feet in height. SEG Fabric and Frames are used frequently in retail environments, but can also be seen as backdrops for many live televised events, like the Republican Debate seen on FOX News. 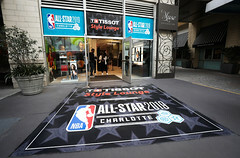 SEG Fabric is a popular option for these events because of its non-reflective properties and matte appearance. Johnston and Murphy are a great example of how to properly light SEG Fabric from the front. 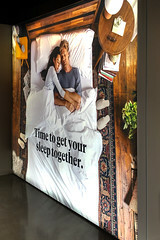 By layering different size frames inside their storefront and properly lighting the graphics inside, they prove that frontlit fabric graphics can be as effective as backlit. 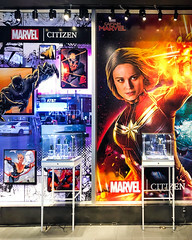 Inside Macy’s Herald Square SEG Light Boxes and Backlit Fabric can be found almost anywhere you go inside this massive 2.2 million square foot flagship store. The large SEG Fabric Light Boxes feature gorgeous fabric graphics from many luxury brands including: Michael Kors, Ralph Lauren, Hugo Boss and many others. Like many other retailers, Cole Haan is also using SEG Framed Fabric Displays to promote new collections in the retail environment. SEG is a very attractive signage solution among retailers because of its frameless appearance. Recently spotted at the Denver International Airport, the enormous SEG Fabric Signage Display was wide enough to hang over five moving sidewalks. For large public arenas like airports, SEG has a lot of advantages. Frameless Fabric Light Boxes are a great way to showcase brand imagery. The SEG Fabric Light Boxes found in Aldo provide a luxurious frameless appearance, while illuminating the backlit fabric from behind. One of the best parts of SEG Fabric and Frames is that each one can be completely customized to fit almost any environment. 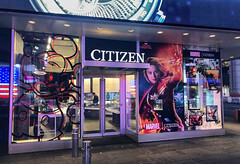 H & M has several standard 30″ x 40″ Frameless Fabric Light Boxes, but also has a long horizontal light box to fit their cash wrap signage zone. Each double-sided SEG Frame has the option to be wall-mounted, free-standing or ceiling suspended. Just like the SEG Displays found in the Converse store, these double-sided SEG Fabric Frames are lightweight enough to be ceiling suspended safely. 40 VISUALS did not produce the above mentioned SEG Fabric Displays, but is a leader in SEG for our clients. If you are interested in learning more about SEG Fabric and Frames please give us a call at 800-962-3119 or fill out the contact us form.